Considering how stressful much of the year was, it ended up being pretty good. We sold out old house, moved into the new one, bought the new one (in that order), and are loving it -- especially now that we're pretty much moved in and settled. My work with Green Ronin has been a high point for me. I really enjoy it and the extra money is very helpful. It's also been so nice to get the chance to do some creative work that I feel is going somewhere. This work also reminds me that I need to do some writing/game creation of my own. My day job? Meh. It's better than last time, but it's not what I want to be doing. And I've already begun to worry about being unemployed when the contract is over in July. I'm very motivated to find something full-time again. I need a job-job for financial and mental health reasons. A regular check is very soothing to me. Gaming has been good, although a bit spotty over the last couple of months due to the holidays and such. Regardless, it's been fun. Plus, I really enjoy the guys I'm gaming with, which is great. It's taken far too long to get to this point, but I'm happy it's all come together like it has. At the start of December Julia and I celebrated our third annivesary -- and we got engaged. I love that girl. I think that's about it for my yearly recap. Things are generally good with one or two things that definitely need improving. And those are already being worked on, so I'm hoping next year is even better. Christmas is over and I'm back to work today. I just spent a good couple of hours going through a file and transferring info from one to the other, so I wanted to take a quick break and relax a bit. So, it's time for a quick blog update. We were going to have a little get-together last weekend with some of Julia's out-of-town family last weekend, but the snow kept everyone home and we reschedules for this weekend. And really, the snow was pretty crazy. Actually, all week (and more) has been crazy with snow, icy streets, slush, and cold. Seattle is not a city of extremes, so a week of sub-freezing temperatures and more than a foot of snow accumulation is really just too much for the residents. Everyone without a 4x4 or experience driving on crappy, crappy streets is pretty much house-bound. The streets are so bad because the cities don't have the equipment to handle the snow and so one layer never gets cleared off and forms the base of the next layer and so on. It leads to icy, slushy, uneven streets that are pretty tricky to drive on. I've seen more than a few cars trapped in deep snow on side streets. I'm very happy my house is on a main thoroughfare. Other highlights included some money (which will go into the 'new computer' fund), an iPod Touch, new tennis shoes, the 3rd season of Deadwood on DVD, some clothes, a new beard trimmer, a board game, and some other goodies. The rings were really the best part of it, though. And today I'm back at work. Tonight I'm headed out again to go to Julia's nephew's birthday party and tomorrow we're having some of her family over for the get-together that was supposed to happen last weekend. I'm all peopled out, but it's been a good week. Time to write some emails and then get out of here. Later. And There Was Much Relaxing! This past weekend was excellent. I think in the last year I've had very few weekends in which there wasn't something going on. The time's been filled with staging the old house, keeping it clean, packing, moving, organizing, and all the little errands in between. But finally, this last weekend it was like things were back to normal. I didn't have anything planned for all day Saturday and Sunday, so Julia and I stayed home and did whatever we wanted. It turned out she wanted to make jewelry and I wanted to write and play games. Perfect. It was so nice and so relaxing. I should have said this first; we had one thing planned for the weekend, and that was to go to Julia's work party in Seattle. It was held Friday night on a boat moored in Lake Union. We had a nice dinner, some drinks, and played fake gambling games. (Which means they gave us about $30K in chips, but we couldn't trade them in for cash at the end of the night for real money.) We played a bunch of blackjack; I lost, Julia won a bunch. I'm taking her to Vegas. Monday morning Julia was sick and ended up staying home all week with a cold. I avoided contracting it, which was very good. I don't have any sick time, so it would be bad for me to get sick. Tuesday morning I didn't feel very well and I thought I was getting sick, so I cancelled out of the game that night. I'm bummed about it, but it allowed me to hit the sack early and that seemed to end the threat of catching cold completely. Thursday morning we woke up to snow. Julia was feeling well enough to go to work, but the roads were bad. Seattle's just not set up to handle snow, so the roads (even the highways) were clogging up. In an hour and 15 minutes we'd made it about 5 miles (from exit 4 to exit 9, about 1/3 of the way to work) and I was seeing more and more signs that it was only going to get worse, so I convinced Julia that it was best to turn back. We did and it turns out we made the right choice. That night Julia and I made some cookies and frosted them with a mixture of maraschino cherry juice (Is juice the right word for that?) and powdered sugar, then topped them with some M&Ms and other little treats we had around the house. They turned out very well, actually. The other thing I accomplished this week is that I've cleared all of the boxes out of the downstairs hallway. That space was acting as our staging area for boxes to go upstairs and I finally took them all up. I still need to organize my office and game room, but at least the boxes aren't in the public spaces anymore, which I'm really happy about. Today I'm at work and clearing up some things I couldn't take care of yesterday from home due to a bad connection to me work email server. Ugh. What a pain that was. It's good to get some of that taken care of. At lunch I even had time to run out for comics -- and I picked up a board game that normally retails for $25, for only $15. Considering I almost bought it a couple of years ago at GenCon for full price, I consider this a good thing. The game is Desert Bazaar and I'm hoping to play it this weekend. Julia and I sent our old couch off to Goodwill and had a new one delivered (purchased at a garage sale). And once that was done we went out to buy a Christmas tree and spend the early afternoon getting that set up and decorated. You can see the exciting process in my Flickr stream, but I wanted to post a nice picture of the tree here. So enjoy! Merry Christmas! Now to get some gifts under that thing! I mentioned the candles Julia and her friend made last weekend in one of my recent posts. Tonight I took some pictures and posted them to Flickr, so you can check them out in the badge on the right-hand side of the blog. 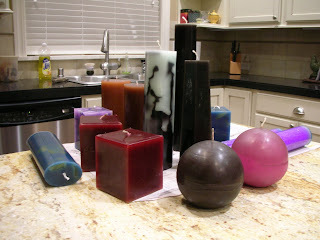 I had a hand in making a couple of them, too (three three darkest ones shown here), and am proud to say that a couple of my really old candles live on in a new form! Fun stuff! I wouldn't mind doing that again! I added a picture of myself over in the sidebar at the right. The picture was taken at Halloween a few years ago. It's me holding an extended tape measure toward the camera. I figured it would result in a pretty cool picture and I was right. The week so far has been good, although I think I'm fighting something off. My eyes hurt a bit and I've had a couple of instances of a sore throat, but nothing that's lasted more than a half hour or so. I think I can head this off with enough sleep. Tuesday morning I got to work, dropped off my stuff, and went for a 30 minute walk around campus. Okay, actually, I walked over to a parking lot, up all the levels and around the top three or four times, then walked back to my desk. I did the same thing this (Thursday) morning. I figured it's the best time of day for me to get in some exercise since I usually arrive by abotu 8:00 and can be done at back at my desk before anyone else is in. My shins are giving me a bit of a problem, but I think I just need to strengthen them a bit. I'm spending a bit of time every night working on my Green Ronin work, but I'm not getting as much writing done as I'd like, so I'm going to concentrate on that for a while. I've been working on one project for a while now and it's approaching completion, but not as quickly as I'd like. Of course it doesn't have a deadline and isn't on the schedule, so that might explain that. Otherwise things are good and Julia and I are preparing for the holidays. No tree yet, but only because we don't want to get one that's all wet from the rain. Maybe we'll just have to let it dry out in the garage. I'll let you know. Julia and I had a great weekend! Neither of us can even say why we had such a good time, but we did. Friday, Julia spent most of her day working in the yard with her mom, planting some things, adding a small footpath, and spreading some woodchips to make the beds look good. In the afternoon she worked on her studio and really got things looking good in there. She also did some picking up around the house to prepare for a "crafternoon" with a friend on Saturday. As for me, I found two things last week; 1) it was a free weekend on City of Heroes, and 2) I'd been invited to join the Champions Online beta. I spent Friday night downloading the Champions beta and checking it out, but my system can't quite handle it, so I think I'll have to opt out of playing that until I can upgrade my computer a bit. Saturday, Julia's friend came over and they spent the afternoon making candles. I got to see the fruits of their labor when I returned from playing an excellent game of D&D at Tyler's and they looked great! I forgot to take pictures, but they're still sitting out, so I'll get that taken care of. The science geek and crafty part of me really enjoyed the mad-scientist-like set up required to make the candles. I even made a candle with the wax that was left over, it turned out looking like chocolate. Saturday night I spent some time downloading City of Heroes on my computer (along with all of the updates from their Web site), which took a long time, but when it was done I played for a couple of hours after Julia went to bed. It was fun to play again and if I can find some players, I may start again in earnest. Sunday we slept in, which was great. We both needed it and we had nothing planned, so we did some shopping. (And picked up many, many supplies for the pantry. Like more than ever before.) In the afternoon I rotated between organizing my office, taking boxes upstairs (yeah, still not done with that), doing laundry, and playing some more City of Heroes. And that was about it, but, wow, did we have a good time. It's a good thing we did, because at 5:45 or so one of our cats started meowing really loudly and woke me up. She's usually a pretty vocal cat, especially when she's hunted something down (like the big spiders in the old house), but this meow sounded different. When I got up, I could barely make her out in the early morning darkness and she was laying on the floor near the bed, which isn't unusual. After my eyes adjusted a little I could see she was moving her head strangely, wouldn't look at me, and continuing to meow. What you can't see from this is that her eyes were moving erratically from side to side, which if that doesn't sound entirely creepy, it is. She continued to act like this for a few minutes and wasn't stopping. I thought rabies, but dismissed it because that would make her aggressive, not . . . whatever this was. Head trauma from something she'd done in the night? Maybe. Stroke? Very possible. Regardless, we were worried for her and got dressed, found an emergency vet clinic online (near Seth's place oddly), called them to say we'd be in, found the cat carrier, and took off. Somewhere in there I also called Dr. Chris and he said, "Yep, get to an emergency vet, it sounds like a stroke." We were off, the cat still behaving the same as when we'd woken up about 15 minutes earlier. The vet looked Babby over for a while and came back to tell us she had something called feline idiopathic vestibular syndrome. Which basically means her inner ear was telling her she was spinning and spinnning and spinning. (Interestingly, the 'idiopathic' part means they don't know what causes it.) Talk about vertigo. She said it'd take a while to resolve itself and she may have issues eating, drinking, and going to the bathroom because of the vertigo. She gave us some medicine to make her hungry so she'd be easier to feed and we took Babby home. By the time we were home she was pretty much back to normal, but apparently cats recover faster than dogs (in which this is much more common and can takes days or weeks to resolve). Anyway, that was a fun Sunday morning. Regardless, I'm glad Julia and I were home to help her out. We'll have to watch Babby to see if she has more episodes in the future, but at least now we know what's going on. Whew, enough of that. Happier things next time, I hope. For those that missed it in my last post (I sorta snuck it in half-way through); Julia and I were engaged over the weekend.